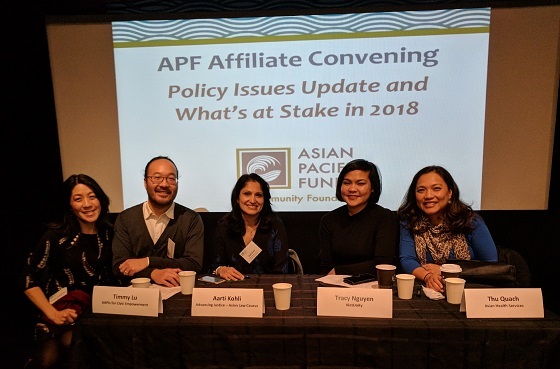 Advancing Justice – Asian Law Caucus Executive Director Aarti Kohli discussed the immigration policy landscape and the impact the current Administration’s anti-immigrant policies have had specifically on the API community. Participants came away with a deeper appreciation for the importance of aligning with and collaborating across different communities and a feeling of hope for the future despite the uncertainty ahead. The Asian Pacific Fund provides quarterly convenings for our network of 70+ affiliates and community partners. Convenings educate leaders about new policies, create spaces to share strategies and best practices, and train participants with the skills they need to build thriving, sustainable and resilient organizations. These convenings are part of our broader Capacity-Building & Civic Engagement Initiative.